Want a low fat burger but hate how dry lean meat is? Adding zucchini to lean ground meat, like ground turkey, makes for a tasty, juicy burger that’s lower in fat! These yummy Garlic Zucchini Turkey Burgers can be made to suit any THM Fuel Type, but they’re good for any healthy meal plan! You can never have enough zucchini recipes, right? If you grow your own zucchini, you know exactly what I mean. Seems like no matter how few plants you plant, before you know it you have more zucchini than zucchini recipes! These Garlic Zucchini Turkey Burgers are a simple, healthy, and delicious way to use your bumper crop of zucchini. You can also make my yummy Zucchini Fritters! Don’t have a garden? Be sure to hint around to your gardening friends that Sneak Some Zucchini on Your Neighbor’s Porch Day is coming up on August 8. Maybe you’ll wake up the next day to find yourself abundantly blessed with zucchini. When your non-THM hubby says it’s good, you know you’ve got a winner! My hubby is incredibly supportive and very rarely won’t eat something on plan for Trim Healthy Mama that’s on the supper table. 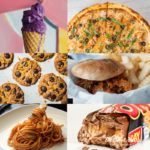 I’ve learned to steer clear of quinoa and kale for him, so those kinds of things are reserved just for me and little Mister, who also loves them. Still, my man prefers “normal” man food. So when he said “these are really good just like they are, I don’t even want bread” I had to suppress the urge to sprint to the PC to type up this post! I knew I had a winner, because my doesn’t-get-excited-about-food man doesn’t hand out “really good” very often. That’s typically reserved for steaks, wild game, pizza, and morel mushrooms. Getting a really good on a THM turkey burgers recipe, well that’s like getting a Michelin star! 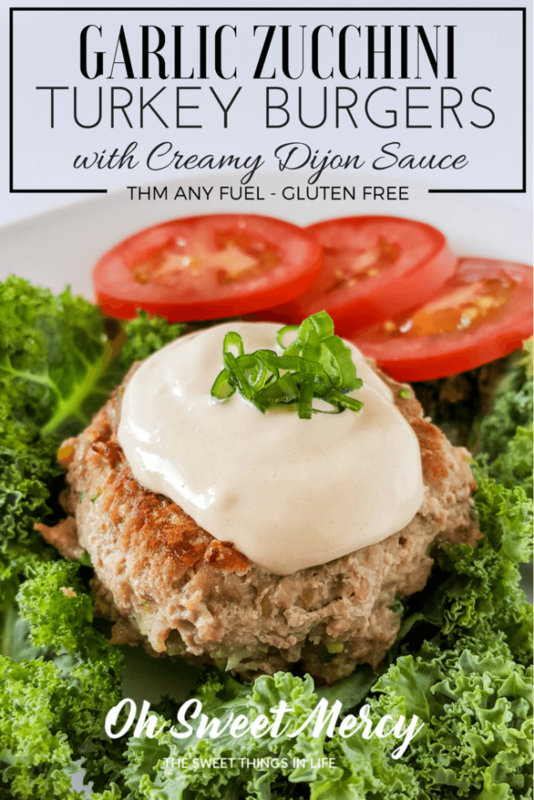 No special ingredients required in this easy and thrifty turkey burgers recipe! 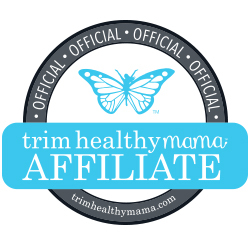 Trim Healthy Mama has an incredible line of “special ingredients ” to help make your THM journey successful. 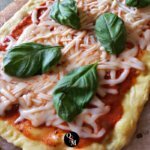 I’ve tried and used several and love them, but my budget doesn’t always allow for keeping special ingredients stocked in the pantry. 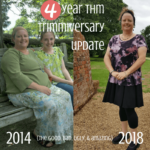 When I first started on THM I did the plan without any special ingredients, just like Pearl and Serene – the plan still works wonderfully without them! Plus, being able to quickly whip up a meal with just what’s on hand (or available locally) makes life a lot easier, doesn’t it? Adding zucchini to your ground meat is also a great way to make it stretch farther. That’s great for your wallet! Trim Healthy Mamas, here’s how to fit this tasty recipe in your healthy eating plan. This recipe can be made with any percent lean ground turkey. I developed it with 93% lean, and 6 burgers will have 6.4 grams of fat each, without the Creamy Dijon Sauce. The sauce has 8 grams of fat for 2 generous teaspoons. Using 97% lean ground turkey, each burger would have just 2.8 grams of fat. For an S meal, use any percent lean ground turkey and top with the Creamy Dijon Sauce. Serve over a bed of organic greens, with a side of garden fresh veggies OR my Garden Fresh Pepper Salad, and 1 cup of fresh berries for dessert (keep blueberries to 1/2 cup). You could also choose an on-plan low carb bread or pita option if you want to eat it like a regular burger. For an E meal, use 96% lean or higher ground turkey, and use the E or FP version of the Creamy Dijon Sauce, or choose plain dijon mustard. Serve with an E fuel such as baked sweet potato, quinoa, or rice, and plenty of non-starchy veggies. For dessert, enjoy my Mango Lime Instant Pudding. 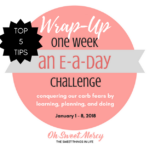 For a FP meal, same as E but keep your carbs low like for S. Enjoy with lots of non-starchy veggies and finish with a refreshing Strawberry Lime Pudding. Want to know more about all this S, E, and FP stuff? 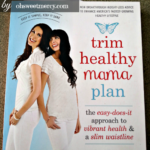 You’ll need the updated THM Plan Book! Grab some zucchini and let’s get cooking! 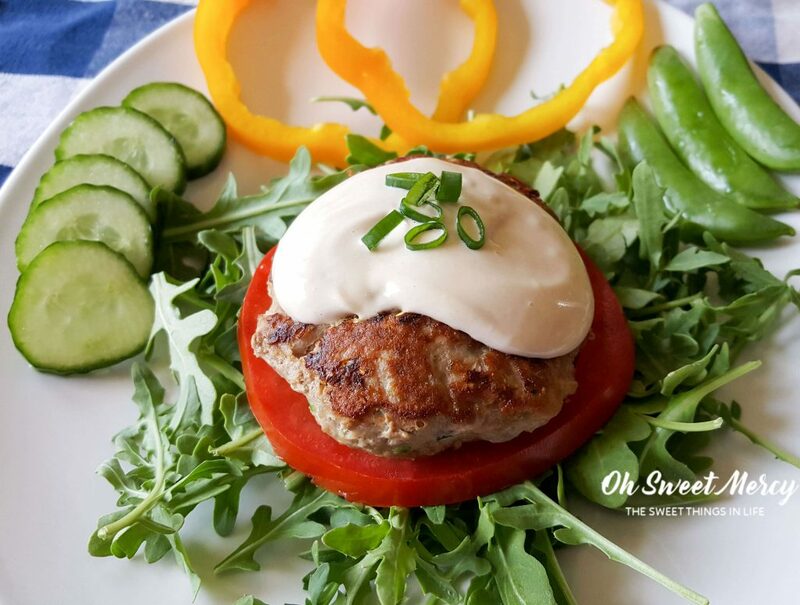 Simple, easy, and healthy these Garlic Zucchini Turkey Burgers are a perfect way to use your bumper crop of zucchini this summer. Stretches your ground meat, too! Trim Healthy Mamas, you can make them to suit any fuel style. Nutrition Information Calculated for S style with 93% lean ground turkey and 2 teaspoons of Creamy Dijon Sauce. For E or FP versions with 97% lean ground turkey, each burger (if you make 6) would have 117.8 calories, 2.8 grams of fat, and 21.5 grams protein. Mmm this sounds SO delicious! Love it all. Will pin and make! Love Dijon sauce! I make similar. Will try yours! Thanks Carol, hope you enjoy! How do you make your Dijon Sauce (if you want to share)? Teresia from Nana’s Little Kitchen pointed out that “dry turkey meat and damp zucchini is a winning combo” – that didn’t even occur to me lol. But maybe that’s why these are so good 😉 They’ll be a regular addition to our menu, and can’t wait to grill them! Made these tonight and they were absolutely delicious! I uses a different sauce though. We were very pleasantly surprised at how flavorful and moist they were. Definitely on our “make again” list. Thanks so much for coming back and letting me know how much you liked them. I’m so glad they made your “make again” list!